Lees Ferry (also known as Lee's Ferry, Lee Ferry, Little Colorado Station and Saints Ferry) is a site on the Colorado River in Coconino County, Arizona in the United States, about 7.5 miles (12.1 km) southwest of Page and 9 miles (14 km) south of the Utah–Arizona border. Due to its unique geography – the only place in hundreds of miles from which one can easily access the Colorado River from both sides – it historically served as an important river crossing and starting in the mid-19th century was the site of a ferry operated by John Doyle Lee, for whom it is named. Boat service at Lees Ferry continued for over 60 years before being superseded by a bridge in the early 20th century, which allowed for much more efficient automobile travel. James Jesse Strang (March 21, 1813 – July 9, 1856) was an American religious leader, politician and monarch. 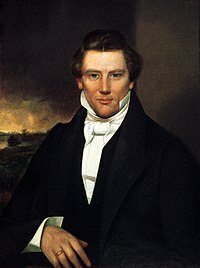 In 1844 he claimed to have been appointed to be the successor of Joseph Smith as leader of the Church of Jesus Christ of Latter Day Saints (Strangite), a faction of the Latter Day Saint movement. Strang testified that he had possession of a letter from Smith naming him as his successor, and furthermore reported that he had been ordained to the prophetic office by an angel. His organization is claimed by his followers to be the sole legitimate continuation of the Church of Christ founded by Joseph Smith fourteen years before. A major contender for leadership of the Church of Jesus Christ of Latter Day Saints during the 1844 succession crisis after Smith's murder, Strang urged other prominent LDS leaders like Brigham Young and Sidney Rigdon to remain in their previous offices and to support his appointment by Joseph Smith. Brigham and the members of the Twelve Apostles loyal to him rejected Strang's claims, as did Sidney Rigdon, the highest ranking officer of the church. This divided the Latter Day Saint movement. During his 12 years tenure as Prophet, Seer and Revelator, Strang reigned for six years as the crowned "king" of an ecclesiastical monarchy that he established on Beaver Island in the US state of Michigan. Building an organization that eventually rivaled Young's in Utah, Strang gained nearly 12,000 adherents at a time when Young claimed 50,000. After Strang was killed in 1856 most of his followers rallied under Joseph Smith III and joined the Reorganized Church of Jesus Christ of Latter Day Saints. The Strangite church has remained small in comparison to other branches.